Inspiration shots! Some of these are so old and have been in my inspiration folder on my desktop for so long that I don't even remember where I found them. Here are some of my favorite looks for this time of year when its just starting to get cold, but the afternoons are still warm enough to sit outside. Where do you find inspiration, do you save the pictures? 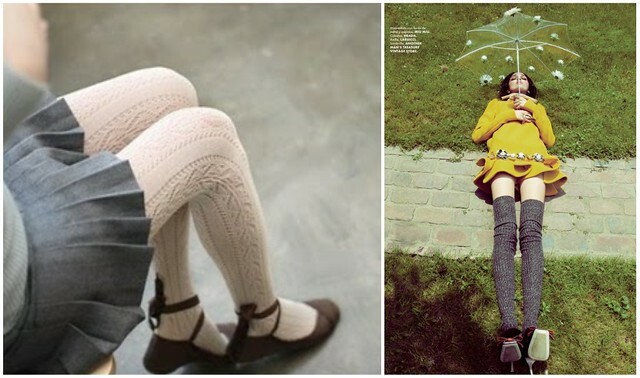 Knit tights or over the knee socks with a wool skirt or dress is a really practical look thats in style this year which to me is inspiration enough. Being short makes short skirts a staple, but having popsicles for legs is no fun. It isn't quite cold enough for that I think, but maybe next week. The first picture is really old and I remember originally loving the wintery mix of colors and textures, but unfortunately not where it came from. Maybe Sockdreams? The second pic is a recent one from Elle Mexico via Fashion Gone Rogue and pairs two of my favorite colors in wintery fabrics. 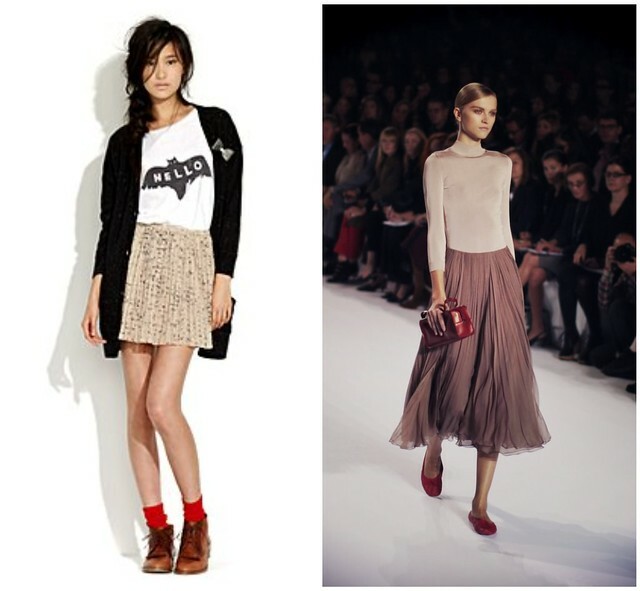 Plus, I'd like to marry that MiuMiu dress. These are really old. The one on the left may have been the Sartorialist, either way, I was told to never pair brown and black no matter how hard it was to find a pair of tights that could possibly match brown shoes/purse, thats just what I did. Until I saw this picture, bought a million pairs of black tights and never thought twice about it again! 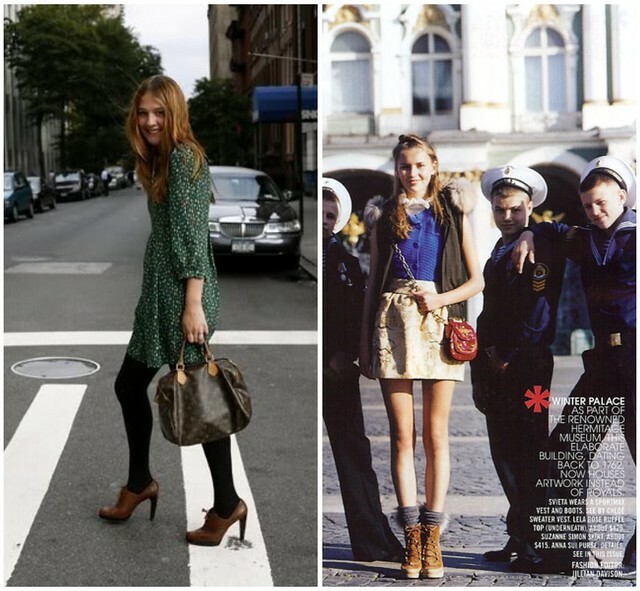 The second one is from TeenVogue, and I love the bunched up socks and sturdy looking shoes with such lady like clothes. It was the first time I thought mixing styles looked really well done and could be pulled off in public. Lara Stone in Vogue UK, reigning superfox. I could wear pretty 60's inspired dresses and cute pumps with bows all day every day. So I know she hasn't been blogging for years, but Agathe had really great style. I still go through the archives of StyleBytes when I need a good idea or two when I don't know what to wear to work. I wish she was still blogging, but someone else has taken over the site and its not quite as inspirational as it was before, but at least they keep the old pics up. i love the over the knee sock paired with tights + boots! it's the warmest combination ever! I just have a little folder in my documents called "inspiration" and I kind of keep it there in no particular order hehe. I love all these looks! I never have the courage to wear my charcoal thigh high socks because I feel like my legs are too short to really pull it off, but I might need to just get over it and bust 'em out. Hmm. i adore the red socks look; beautiful outfits! I love this post, thanks for sharing all the inspiration! these are inspiring for me too! thanks for putting them up! love love love all these photos!!! This is just what I needed, love. these are soo inspiring <3 makes me want to throw all of my clothes out, go shopping, and buy these ones. and great post! there´s so much inspiration!